For all their clickbait connotations, “best of” lists have always resonated with the Magic community. Something about us—perhaps as spell-slingers, or maybe just as humans—simply adores scrolling through a list… whether that scrolling induces nods of agreement, disapproving tsk-tsks, or furious keyboard mashing. Modern Top 5 is a series I’m starting today in honor of that infatuation. It will cover staples, decks, and anything else that inspires another edition of Buzzfeed’s oldest trick in the book. This first edition focuses on the format’s best utility spells. As with any “best of” list, my choices are sure to be controversial to some degree, but the value quantification system introduced in this article will hopefully help justify my choices. Let’s hop to it! Well, before we do any proper hopping, we should flesh out the term at hand. Mark Rosewater has defined utility cards as those “that serve singular, basic, evergreen functions.” While I understand the appeal of this definition from the designer standpoint, where the term “utility” compares to, say, “build-around,” I think it holds little merit for the competitive player. We already classify the sundry spells Rosewater considers “utility” such as Murder, Counterspell, etc. as “removal,” “permission,” and the like. “Utility” becomes more useful to us when it comes to classifying a trickier card like Simic Charm, which sometimes doubles as either. As I define it, utility describes a card’s ability to play different roles. Simic Charm, then, is a quintessential utility card—not only can it serve as removal with bounce mode, permission with hexproof mode, or pump with +3/+3 mode, it does cool stuff like stop triggers from Ulamog, the Ceaseless Hunger or provide reach during combat. Since utility cards do so many different things, they’re frequently metagame-dependent. As such, the utility cards played in Modern decks generally occupy flex slots in the main or address strategic weaknesses in the sideboard. Most of the “best of” articles I’ve read list a series of cards or decks and provide a couple of thoughtful paragraphs on each, doing little to justify the list’s order, or to quantify the value of each pick. I think it’s crucial we approach our lists in Modern Top 5 with a few parameters in mind. We’ll rate each of the five utility cards in this article on a scale of 1-5 for power, flexibility, and splashability, with 1 being the worst and 5 being the best. That way, we can establish a hierarchy at a glance and come out with a clear winner. Power: The degree of impact the card tends to have for its cost. Flexibility: The card’s usefulness across diverse situations and game states. Splashability: The ease with which Modern decks can accommodate the card. Power and flexibility will be rated by considering both a card’s floor (the least it will do) and its ceiling (its best-case scenario). For example, Lightning Bolt‘s power floor is higher than Fatal Push‘s, as Push is dead when opponents have no creatures while Bolt can go to the face. Splashability will be rated by considering how many existing Modern decks can accommodate the card and whether they’ll want it. For example, despite its lack of a color identity, Ghost Quarter doesn’t fit into BGx midrange decks. These decks can easily run Fulminator Mage as mana disruption instead, and prefer not to miss a land drop if they don’t have to. Outlining these three parameters solves for Simic Charm‘s elusiveness. Unsummon, Giant Growth, and Mizzium Skin are all one-mana effects in Modern, but Simic Charm costs two mana. As such, it leaves much to be desired in terms of power; the format’s other two-drops far exceed the power level of each of these effects. Despite Charm’s flexibility, it does next to nothing when pilots lack a clock, robbing the card of some points on this metric. And in terms of splashability, Charm’s appeal is limited by its UG cost, and by its strategic restriction to creature-based decks in need of flexible utility spells. Temur Delver happens to make great use of Simic Charm, but it’s no wonder we don’t see it elsewhere in Modern. I would rate Charm 1-3-1 on this scale, giving it an unfortunate overall rating of 5 out of 15. With the method out of the way, let’s hop to it for real! In terms of effect, Ghost Quarter is essentially Sea’s Claim. Sea’s Claim is no Modern all-star (it’s only seen in Merfolk sideboards, where it gains extra utility by granting creatures evasion). But in some scenarios, Ghost Quarter far outdoes Sea’s Claim. Quarter can go off at instant speed and doesn’t have a color requirement, making it something of a colorless-costed “Seal of Sea’s Claim” (using Quarter right away costs a functional mana, since it uses the turn’s land drop). Threatening to pop activated creature lands or to disrupt colors can force opponents to expend valuable resources getting it off the table. Against decks with few basics, including Death’s Shadow variants, it quickly turns into a free Stone Rain. Combining it with Leonin Arbiter or Aven Mindcensor yields the same result. And combining it with Surgical Extraction instead can devastate big-mana strategies. Ghost Quarter‘s aforementioned benefits over Sea’s Claim make the land much more flexible than its enchantment counterpart. But Quarter’s most flexible quality is its ability to just tap for mana each turn. That Quarter does something so universal and crucial, in addition to offering a unique disruptive effect, secures its status as the only land-destruction card to earn mainboard slots in competitive Modern decks. 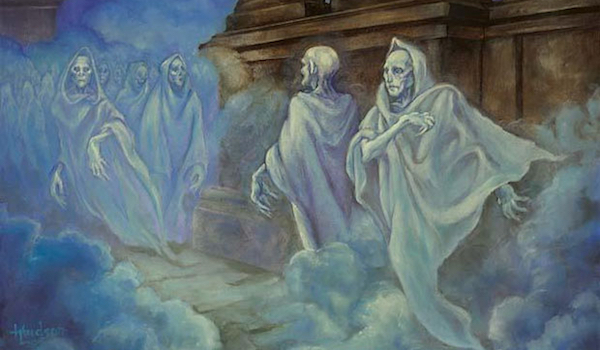 Any deck can theoretically play Ghost Quarter, a colorless land. But decks with color-intensive mana costs like Burn or Death’s Shadow, which have little use for generic mana, should avoid Quarter like the plague. Decks that require a critical mass of a certain kind of land, like Scapeshift, also lose out on Ghost Quarter, as do ones that need their lands for other purposes, like Affinity. Anyone else can play it, though; I’ve even seen Quarter in some sideboards, and it’s a strong tech choice in decks with ways to search it out (Ancient Stirrings, Expedition Map, Knight of the Reliquary). Playable Vindicate effects are rare in Modern, and limited mostly to Maelstrom Pulse and Abrupt Decay. The former is so gently played because of its prohibitive cost, and the latter because of its Inquisition of Kozilek clause. Engineered Explosives kind of suffers from both of these drawbacks at once. Casting and cracking Engineered Explosives is almost always a tempo-negative play—when it can’t remove a swarm of tokens, or multiple cards with the same converted mana cost, pilots are all but guaranteed to lose some mana on the exchange. It’s also quite rare to encounter Modern decks that reliably produce four distinct colors of mana and play Engineered Explosives. With all that being said, Explosives is one of the format’s few true catch-alls, and it occasionally enables blowouts. Pulse might kill two Goyfs, but it won’t kill a Goyf and a Scavenging Ooze. And EE’s effect doesn’t target, which lets it handle boards full of beefy Bogles. The main reason to play Engineered Explosives is its flexibility. Here’s a mainboard-worthy card that ensures players can answer anything. Liliana of the Veil with six counters? No problem. Ensnaring Bridge? Still in the game. Souls flashback Souls? Let me just Snapchat my buddy this board. Explosives might be costly, but it really does it all. Color-light decks like Tron and Skred, as well as mana-light decks like Burn and Death’s Shadow, can’t splash Engineered Explosives. The artifact limits itself mostly to three-color midrange decks (although some two-color decks can also play it profitably). In those, it’s a staple. It even gives certain wedges and shards the ability to destroy permanents they would normally squirm against, like Tarmogoyf against Temur or Rest in Peace against Grixis. Thanks to the card’s high flexibility, even decks with in-color removal for everything, like Abzan, are liable to run a copy or two. Lightning Bolt is Magic‘s original utility staple, and that’s largely due to its absurd power level. One mana, one card, three damage. At any other point in Modern’s history, I would have given this card a 5 for power, but Bolt really ain’t what it used to be. One of the best cards in the format? Sure. But the iconic spell’s main task in the decks that play it is to remove cheap creatures, and Fatal Push straight-up outclasses it there. Bolt owes its flexibility to the pliable nature of damage-based removal. Consider the other forms of removal: exile, which is dead in creatureless matchups; destroy, a strictly worse exile; and bounce, a strictly worse destroy. Damage-based removal can also slay planeswalkers, and goes straight to the dome against Ad Nauseam, Scapeshift, and other linear combo decks, making it hugely valuable for any kind of fair strategy. Even Scapeshift itself makes great use of Bolt in combo mirrors, where it shaves a turn off the clock by allowing for lethal Scapeshifts at seven lands. Red decks with low curves and high curves alike love Lightning Bolt, so long as they can do something with Lava Spike mode. Otherwise, they’re usually better off playing Fatal Push or other more reliable kill spells, if any—these decks generally employ a highly proactive gameplan and only run interaction in the sideboard (UR Storm, Grishoalbrand). Modern also houses a few interactive red decks that don’t play Bolt for other reasons, including Death’s Shadow Jund (which prefers Tarfire for its added utility dimensions) and RW Prison (which omits one-drops in favor of Chalice of the Void). It should be noted that one- or two-color decks in the market for cheap removal/utility spells can splash red guilt-free. Since Lightning Bolt is red, the risks of being shut out by Blood Moon are mitigated by splashing the color Moon forces us to produce. Consider UG, and how easily Temur operates under a Moon compared with Sultai—while Fatal Push is better at killing creatures, Bolt’s flexibility can’t be understated, and the Temur deck can even sleeve Moon up itself! As for the drawback of discarding cards… who cares? Card advantage is way overrated in this format, and Brutality decks are likely to have extra cards to throw around most of the time. When staying alive against aggressive opponents is a priority, it dumps clunky spells like Gurmag Angler or Ancestral Vision. In grindy games, it recycles sandbagged fetchlands. And in decks with graveyard synergies, Brutality’s escalate cost can even create an advantage. At the end of the day, every deck has extra cards sometimes. Brutality turns them into relevant effects without guaranteeing card disadvantage just for sleeving it up, unlike, say, Faithless Looting. Collective Brutality shines at all stages of the game. Over the first few turns, it kills attackers and strips an opponent’s hand of relevant cards. Discard mode is even valuable against creature-heavy decks like Company and Eldrazi; early on, they’re likely to have targets. Later, it helps close out games with reach, clears the way of permission for crucial spells, and breaks board stalls. The sorcery also kills weaker utility creatures like Grim Lavamancer and Thalia, Guardian of Thraben at any point in the game. The mere presence of Brutality in Modern changes the way games are played. It does for black decks what Kolaghan’s Command did for BRx decks by giving them a mainboard-worthy hate card for one of Modern’s premier aggro-combo strategies. Throwing Bolts at a Grixis opponent isn’t as reliable now that the shard can gain life out of nowhere. Since Brutality is so brutally productive, it’s a natural fit in any deck looking to get to the mid-game. It’s also an obvious shoe-in for graveyard synergy decks like Dredge. Thanks to its cheap cost and lenient color requirement, any deck with black mana or a highly stable manabase can run Brutality. Just last month, Cory Gorman splashed black for three copies in his Classic-winning RG Scapeshift deck. While Surgical Extraction reads like a -1, it often trades for an opponent’s card. And it does so for no mana, something very few Modern one-for-one cards can lay claim to (actually, just Gut Shot, which is significantly narrower). Only blind (and bad) Surgicals really whiff. Surgical Extraction is one of Modern’s most skill-intensive cards, and experience directly translates to Surgical strength. Like Engineered Explosives, Surgical Extraction possesses an extremely high ceiling. Even during one-for-one trades, Surgical sometimes nabs an extra card, like when it exiles Griselbrand in response to Goryo’s Vengeance, or incidentally hits a second copy of a target in an opponent’s hand. The truly devastating Surgicals are those that hit Past in Flames after a Gifts Ungiven from Storm. Or Manamorphose in response to a mid-combo Past in Flames to deny the Storm player any more blue mana for the turn. Or Finks after Abzan Company expends resources Chording for their combo pieces to turn off the deck’s infinite life dimension altogether. Or Ad Nauseam after nabbing a copy with Thoughtseize. In this last instance, Surgical actually has the four-mana effect of Cranial Extraction; in the others, it stops game-winning plays cold, sets back an opponent’s development, and steals tempo. The primary aspect that gives Surgical so much power is its mana cost. Meaningfully interacting with key plays from across the table while tapped out is big game—it basically translates to having Grafdigger’s Cage in play against Abzan Company, except the Company player can’t remove it and doesn’t even know you have it until your eyebrows raise in preparation for the you-just-activated-my-trap-card face. Last but not least, Surgical’s granting of perfect information makes siding for game three a cakewalk. And seeing an opponent’s hand reveals when to go for it with Temur Battle Rage. In Modern’s Twin days, Surgical Extraction was a fringe sideboard option for combating combo plays. Today, the card also boasts applications against most fair decks in the format—Kolaghan’s Command, Snapcaster Mage, Traverse the Ulvenwald, Liliana of the Last Hope, Renegade Rallier, and Kitchen Finks all give the card something of value to do when it isn’t totally neutering opponents. Surgical’s relevance against fair and unfair decks alike give it extra play in matchups that can go either way. Take Company, where it either blows out the combo or exiles all copies of Collected Company to insist opponents play a boring creature deck (well, more boring). Or Dredge, where it either eats all the Prized Amalgams or just keeps a stumbling opponent off dredgers. Or Death’s Shadow Jund, where it either soft-counters Traverse the Ulvenwald by removing a card type or exiles 50% of the deck’s threats in one fell swoop. Or Ad Naseaum, where it removes all copies of the deck’s namesake spell or just messes up the scry from a Serum Visions. You can even pay B for Surgical if you want to. Talk about options! Literally any deck can play Surgical Extraction. Eldrazi Tron plays it, and that’s a deck with Chalice of the Void. Utility cards don’t get more splashable than this one. In Monopoly, utilities were often the least exciting properties to own. But in Modern, utility cards give lists their personality, lovingly hogging the flex spots in Tier 1 and Tier 3 decks alike. Hopefully, this article provides you with a useful metric by which to analyze utility cards for competitive play. What did you think of Modern Top 5? Which categories would you like to see me dip into next? Let me know in the comments. I don’t really think Surgical should be at the top of this list. All of those other cards are mainboardable; Surgical is not. If a card is so dead in some matchups that very few people would have it in the maindeck, then it’s not a utility card. A versatile sideboard card? Yes. Better than Collective Brutality? Not even close. As written in the intro, I define utility cards as ones that occupy either mainboard flex spots or sideboard flex spots in most decks. Whether a card regularly makes it to the mainboard doesn’t affect whether it’s a utility card, and doesn’t affect the points it scores. Surgical simply has more points than the other cards, so it helms the list. The “I don’t think it belongs because X reason” is exactly what I strived to avoid with this article, since I think that mentality produces jumbled “best of” pieces that lose credibility by failing to quantify the value they assign to their choices. Your objection actually illustrates this point perfectly, as it’s based on a fallacy; in fact, a simple mtgtop8 search reveals that Surgical does see mainboard Modern play (it’s a staple in Lantern Control, and can also be found in the lesser-seen UB Mill). I wanted this list to be founded on clearly-defined, measurable metrics specifically to avoid this kind of feeling-based, statistic-ignorant reasoning. Surgical doesn`t have more points than the other cards. You assign the points to the cards by your own choosing, based on whatever ideas you might have about them. Where is the quantification in that? On another note, I think alot of the content you produce on this site undermines its credibility, as shown by your reply to elmahnken. If you want to make lists with some authority I think you need to put more work into it. It’s impossible to completely divorce subjectivity from a Top 5 list. The point of the ratings system in this article is to facilitate constructive discussion about why choices are right or wrong, and of course the numbers themselves will change depending on other options and metagame shifts. I’m sorry you feel that way about my content and am open to suggestions; I actually worked quite hard on this article! You held up Simic Charm as the exemplar of flexibility as part of your definition of utility. I think you got away from that in the your surgical extraction choice like previous commenter says…the card does one thing. Like it’s name suggests, this is not an example of a tool that can be used to wide effect. It is designed for a narrow, specific purpose; as per its flavor. Not as the examplar of flexibility; indeed, I only gave Charm a 3 on flexibility. It’s a card I like a lot and have played with a great deal, and one I have frequently described to pundits as a utility tool. It made sense to me to use Simic Charm as an example utility spell so that I could easily outline the parameters used to analyze the other cards in this article. As for Surgical, the card only has one mode, but it’s far from a card that only does one thing. I’d argue it has much wider applications than Simic Charm and is therefore more flexible. Your comment leads me to believe you have not played with Surgical a lot (don’t mean to sound presumptuous, but yours is just a viewpoint I’ve heard plenty of times from those new to the card and never from experienced Modern players). Isnt cryptic command a ten here and better than ghost quarter? The splashability is terrible but flexibility through the roof (can we give a 6?) and power a 4 or 5. I also feel like kolaghans command belongs. Unless the hidden rule was “no modal spells, too easy” because they are the archetypeal utility cards imo. I would rate Cryptic 2/3/1. At 6 points, it’s significantly worse than Ghost Quarter. None of its modal combinations are particularly cheap—the best bargain is draw + counter, for which 1UUU is still quite steep IMO (Leak is the benchmark counterspell in the format, and paying UU for a cantrip is hardly appealing). As for flexibility, Cryptic is rarely truly “dead,” but spending an entire turn’s worth of mana tapping and drawing isn’t anything to write home about. “Surviving” a turn generally costs your whole turn anyway because of CC’s mana cost. That’s when Cryptic is at its worst—when opponents are beating you down. That it can’t really address boards of creatures permanently, or even help dig into real answers with any kind of selection, hurts its flexibility for me. And as you mentioned, the card is very tricky to splash. Keep in mind that a low score based on these parameters doesn’t make the card bad or unplayable. Indeed, CC does see play; similarly, I swear by 4 Dismembers in Eldrazi Stompy, and wouldn’t leave home without Simic Charm in Temur Delver or Bauble in DSJ. One thing all these cards have in common is that they’re pretty narrow in terms of splashability; very few decks want the effect, but of course those that do, do. Kolaghan’s is much better than Cryptic for our purposes. It’s more splashable than Cryptic, is relevant in more gamestates (helps stop a beatdown by killing a dude and returning a fatty; “locks” topdecking opponents out like CC does with the discard mode), and has better effects (2 damage and return a guy are insane modes in this format). I would give it 3/5/2. So why didn’t it make the list? Cause I forgot about it! I think with any best of list, cards are always going to slip through the cracks. What’s the name of the card the thumbnail picture at the top is from? It’s Ghost Quarter’s original Dissension art. A better title for the article might be “splashable interaction/hate” as that’s more accurate and justifies the splashability category being worth as many points as the others. Well, I stated in the introduction that splashability was one of my three parameters. “Best” is subjective, and to me, a card can’t be the “best” if it isn’t playable across multiple archetypes. If you disagree with my definitions, I would be interested in hearing others and in reading your own Top 5 list! Hello, I enjoyed the article, however I am curious why dismember didn’t occupy a spot on the top 5. As a colorless removal spell, it seems very versitile especially in a format with tasigurs and gurmag anglers trying to get around fatal push. Dismember doesn’t hit larger creatures and does nothing on a creatureless board, making it significantly less flexible than cards like Bolt. It’s also a liability at low life points. Modern decks are usually built with Burn and other aggressive strategies in mind, and already budget their life points closely with fetches, shocks, fastlands, etc. according to the amount of aggression they think they can weather. Dismember throws those ratios off and limits it to decks that don’t take enough damage, which are relatively rare. Colorless Eldrazi and Merfolk are examples of decks with life points to throw around AND that don’t have black/red/white, making them good fits for Dismember. I would rate Dismember 3/2/3 today, which is less than it would’ve gotten pre-Push; recently, most decks in the market for a one-mana removal spell are already in red, white, or black anyway. Isn’t it? I disagree with some of your ratings, but as will always be the case with card evaluation, a degree of subjectivity is inevitable. The idea with this article was to break down the subjective aspect into smaller sections to make it easier to discuss and argue about a card’s merit with others. For instance, I would give Relic a 3 on flexibility (one more than you) since its floor is a new card, but only a 3 on splashability (one less than you) since so many decks use their graveyards enough that nuking both isn’t feasible. It’s NOT Duress. It makes my eyes bleed everytime someone says that. Duress can hit Planeswalkers, enchantments, and artifacts as well as instants and sorceries. If Collective Brutality truly had a duress mode it would be an absolutely bonkers card. This is an interesting article Jordan, and I like the metric you’ve put together to evaluate the card choices. I’d be interested in what cards scored 6-10 (so maybe do some top 10s now and again?). I did have one minor quibble, not with your metric or card choice, but with your surgical analysis. As you’ve noted, surgical is typically a sideboard card in shadow decks, and battle rage typically a game 1 gotcha that you side out for cards that actually do something, so I think it’s a very rare situation where you’d see surgical and battle rage inter same 60. Lol! Tbr has given me more headaches than any other card in that deck, so I’m more likely to be doing it wrong. I’ve typically boarded out tbr (I run 1 tbr and 1 ghor clan rampager ) consistently as part of my flex slots, and even against tokens would rather have a sweeper in most instances. Best way to understand this kind of thing is to just jam a lot of games. Not only will you get a sense of which matchups TBR is best in, but you’ll start to understand which players to leave it in against based on how they navigate the red zone against you. Thanks for taking the time to write me back :). That was a really useful, insightful comment. I just noticed no one ever brought up Runed Halo. Thoughts? I’d probably say 3/4/1.